Shocking Halloween Bad Dog Breath! 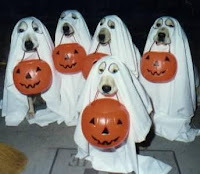 Don't let your dog scare off those cute Halloween trick-or-treaters! Order our Bad Dog Breath Kit today and make sure your dog's breath isn't a frightening odor! Use our Bad Dog Breath Kit and your dog will be much more kissable in no time! Helps improve digestion, stomach issues and overall health. Be sure to get your dog's teeth cleaned too! Soothing Digestive Relief Formula (100 caps)---Helps break down food, reduces stomach upset and improves digestion so food doesn't "sit" too long in the digestive tract. When food doesn't break down immediately it can ferment and cause gas, bad breath and digestive upset. The product helps stop tummy rumbling and painful gas. Stools will be firmer and your pet will feel so much better! Probiotic (60 caps)--Adds proper flora to help reduce the toxins that can cause odors. Helps with diarrhea, indigestion, gum problems, stomatitis. Especially needed if your pet has recently been on antibiotics! Can you please tell me what things I can make for my 6 year old yorkie. I'm not sure what I should or shouldn't be feeding her.